I love Cordon Bleu – and I'm not just writing that because I've had three bottles of champagne (okay, maybe I have, so what, it's Paris and I just finished my final exam!!!). I was calm and collected today. If you've followed my posts at all, then you know I'm a stress case, but today I woke up, ironed my uniform, sank a cup of coffee and caught a taxi to Le Cordon Bleu. I arrived and had another cup of coffee with my cooking partner Jamie, who was also relaxed. We watched other people freak out around us and pace back and forth, but we remained zen. Maybe it's because we practiced at home, or maybe it's because neither of us slept the night before. Everyone's time was staggered and I was last. Being last is the worst because you begin when everyone else is stressing out. Also, any extra ingredients have already been used up and the student assistant is tired of running up and down to the kitchens to get more stuff. Luckily I didn't really need anything extra, except larger artichokes, two lemons, maple syrup, pine nuts, two 'gros carrots', basil, and an onion. Hey – I was the assitstant last time for the Superior Cuisine final – if anyone has the right to ask for more stuff, it's me!! Our proctor for the exam was an Iron Chef. No joke. Guy Shokr was our chef today and he was awesome. For those that haven't watched Iron Chef from the start, he was the first chef to compete against the Chinese 'French' chef (Sakai vs. Shokr, episode 8). He should be returning to the show for a second show down sometime next year. 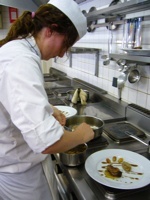 Chef Shokr is also into molecular gastronomy and teaches a course at Le Cordon Bleu on it. Everything went swimmingly today. Seriously, I cleaned my bloody pigeon quickly and roasted the breasts, saving the legs to confit separately. 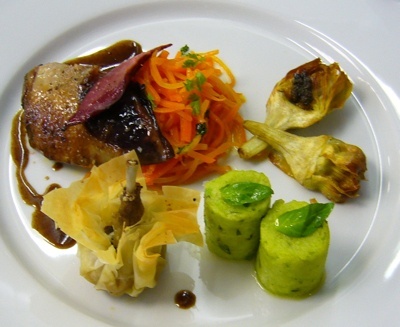 Afterward, I made my sweet pea basil gnocchi, glazed carrots with lemon confit, deep fried artichokes with tapenade, and lastly my little amouse bouche of foie gras mousse, pigeon confit & wild mushrooms. The sauce came out great, the plating was perfect. Yippeee!!! Things got stressful during the last five minutes because they take your plates away when the time is up. If all the food isn't plated, then too bad. I stretched my last thirty seconds to the maximum and even managed to squeeze in a few photos with my Iron Chef before the plates were whisked away to the judges. After I cleaned up and packed my knives away I got a little sneak peak of the rest of the plates from the other groups while the judges were sampling and making notes. There were an awful lot of plates to taste and only three judges to do it. I'm not quite sure how they managed!?!?! We had to plate four identical dishes for our final using specific ingredients. Our plates had to include three side dishes: two composed (more than one ingredient) and one simple (technical). Also we had to cook the meat, which was pigeon (blech!) rosé and serve sauce along side it and on the plates. 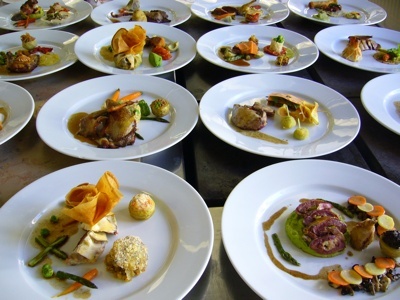 When I saw the beautiful plates from all the groups, my mouth just dropped. Nobody did the same thing. Who knew there were so many combinations of pigeon, sweet peas, carrots, potatoes, foie gras mousse, and mushrooms? Congratulations Ms. Glaze! How exciting, and your plate looks gorgeous too! 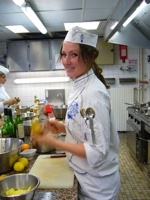 You know, I think your chef Didier might have taught a couple of classes in the London campus--does he have a, ahem, a mustache so large, it can be seen when he has his back to you? Your plates look great and good for not stressing and being zen. In fact all of the plates look pretty fantastic, without being there to taste them, from the looks of things does anyone ever fail? Dude, you are amazing! Congratulations! but are you sure it's hygenic to wear your cooking accoutrements on your head? Tejal– A grande moustache? Oh la la! No I've never known him to have one but the thought is so funny. 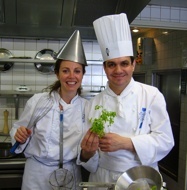 However there is another chef who just retired (Boucherer) that used to sport a little grey stach. What did he look like, do you remember? The chef's do travel around a bit and do demos in other countries. Sam– Thanks for your words of encouragement! To answer your question: people do fail. In our group most people created recipes that they felt were in their skill level and that suited their own tastes and international backgrounds, which accounted for the beautiful range of plates. Also, I think that the quality of teaching is excellent, so the plates are not only a reflection of how talented the students are but how well the teachers are doing. There was a student who failed last time and it was sad. Imagine having to pay all over again – yikes! Chaxiubao – I really didn't have time to take photos, but I knew if I didn't that I would be so mad at myself later! Most of my photos are at the beginning and at the very end. Our Iron Chef really is great in front of the camera and kept adding to my picutres like putting that chinois (lol) on my head and the whisk in my hand – that was all him! Too funny!!! Sara – You little diva you! Break a leg at your upcoming improv show. Wish I was there to see it. And you're right, improv does equal life. wow. so very cool. your blog is like watching top chef as the curve balls are thrown. and it looks delish! Well good for you. Great pics to boot. to take the next level courses. You did a fantastic job. I'm sure that the judges will love your dish. It looks absolutely beautiful--the plating is perfect. If your food tastes half as good as it looks, you'll get an A for sure. Good luck and congratulations on a job well done. Can't wait to hear about your adventures as an intern. Felicitations! Nous sommes tres heureux pour toi! You were fantastic! I was very impressed with you, especially at the end. Cool as a cucumber! And your food was amazing! I ate all the leftovers, I should know! Amy, it has been such a pleasure to watch your Cordon Bleu adventures over your shoulder while reading your blog. I've never even met you, and I feel proud of you! I wish you the very best with you stage (Bon Courage!) and I'm sure you will do marvelously well. I look forward to reading all about it. your food looks great and you make that in your final exam?? i want to ask to you if we take a class in le cordon bleu can we take part time job?? because the cost is really expensive their..